Hoppe is a picturesque and charming pub in the city of Amsterdam. But what makes this club different from all the other ones is that this place opened its door to the public in 1670 and has been one of the best pubs in the destination. This quaint Dutch pub is one of the best places to grab a drink at and comes highly recommended by travellers and locals alike. People normally also visit Museum Willet-holthuysen while planning their trip to Hoppe. If you want an authentic Dutch pub where the locals go, this is it. 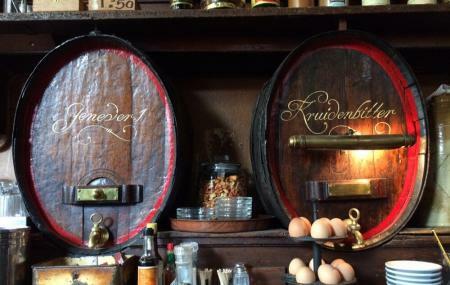 It's several hundred years old, and they serve traditional Dutch drinks and popular drafts on tap. I wouldn't recommend having wine, it tasted like it had been open too long. This is a beer place, drink the beer. Authentic historic atmosphere, not the fake Disney kind. I highly recommend it. A beautiful little cafe and bar, the lady working was very busy but still look the time tell me all about the history of the bar, perfect for anyone interested in the history and culture of Amsterdam! Cosy place, lovely staff, moreish bitterballen and other delicious deep-fried bar snacks, nice selection of drinks, and it’s also the birthplace of the D66 liberal political party. Perfect. Beware of turning up late in the evening and expecting food, though - I think the kitchen closes for bar snacks around 10pm. HURRY.